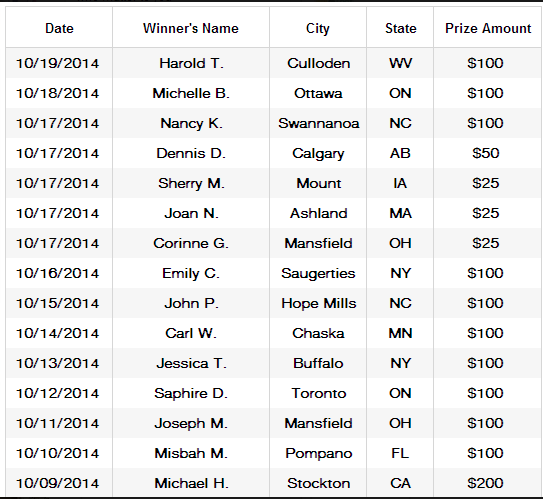 Check out our latest winner list from last week. Want to get your name on this list? Then make sure to keep entering all of the giveaways at Winloot! With twelve chances to win every day on top of the iPad, $500 monthly cash and $100 daily prizes there are lots of ways to win! Some of our winners got on the list by responding to promotions we sent via email so make sure you read the emails that we send if you are a member. You never know… an email could be worth $50, $500 or even $1,000! Keep a look out for even more special giveaways and promotions from Winloot. Don’t forget that our monthly $500 cash giveaway is ending soon, so make sure to play as many games as possible and get your number of entries as high as possible before we pick our winner. As always, we thank you for being a loyal Winloot player and good luck! 34 Cash Winners In One Day Last Week!